Mojang , the Swedish developer behind indie superhit Minecraft , has been teasing us with glimpses of its next game, Scrolls, for quite some time. After two years of development, a long period of alpha testing and a protracted legal battle with Bethesda , Scrolls is finally set for a beta release next Monday, June 3. In the new launch trailer, the blocky voxels of Minecraft have been replaced with cartoony animations, Battle Chess -style turn-based carnage, and Magic: The Gathering-inspired deck building and card collection. It's a very different kind of game, but Mojang is hoping to deploy the same addictive gameplay and vocal online community that marked their first release. Players can expect to use their customized decks to battle computer enemies in single player or take to the online servers for human opponents and potential trading partners. For a complete recounting of the game's systems and rules, check out the brief Scrolls guide and prepare yourself for next week's open beta release. 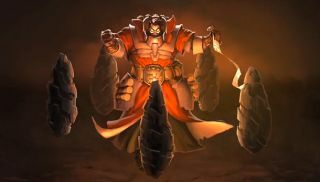 Scrolls's beta phase will be open to customers who buy in for $20 or £13, according to the official Scrolls blog .